I love the aesthetic beauty and ingenuity of nests. 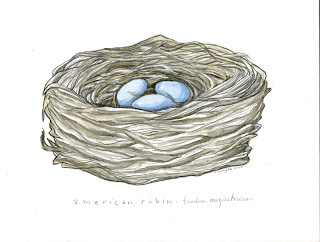 Here's a watercolor I did of a robin's nest. I am hoping to do a few more paintings of different types. This painting went up on my etsy.com shop. I won't be going into the museum this week. Dr. Willard is not in, and I'm very busy getting ready for a art exhibit with my husband that will be happening in Manchester the first weekend of December.